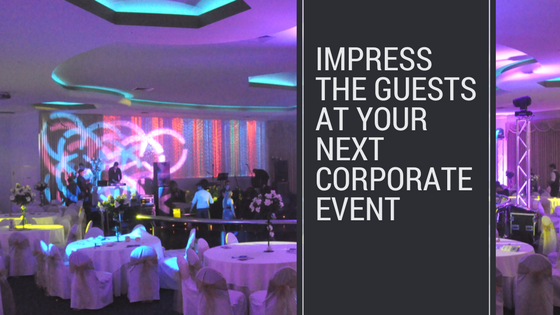 Impressing guests should be near the top of your list when it comes to hosting corporate events, especially if you’re trying to win over clients or ensure loyalty to your company. But how can you make a splash without breaking the budget or spending months planning your conference? Take a look at these two simple ways to ensure your guests leave your event enthused, engaged, and most of all, impressed. Conferences can all too often become boring networking events where little effort is made to dress the venue up. Enter event lighting and decorating to save the day! Hiring professional lighting is an inexpensive and effective way to transform an office, plain boardroom or drab hall into a vibrant and dramatic event venue. Uplighting can help to draw attention to key parts of the room, such as where guests sit and any information displayed on the walls, while clever shadowing can be implemented to hide those areas you’d rather guests don’t see. Simple touches like a warm pink light around the food table and different coloured lights around each guest table will help ensure your event is visually memorable for your guests. Uplights and the right room lighting in the company colours or corporate logo can strengthen the branding of the event, whereas spotlighting the lectern or the stage adds focus to the presenters or the discussion panel as well as helps to light banners and showcase the products. A simple Drape Backdrop or small stage can add a substantial amount of presence to the presentation. People love to feel personally involved at events, and doing this can be easier than you think. Start with your invitations. Even if you’re sending them out to hundreds of guests, take the time to address each one to guests individually, and respond to their RSVP with a brief but warm message expressing how happy you are they are coming. You can also tie your invitation colours in with your decor. For example, if you’ve used a magenta trim on the invitations, you can carry this theme through in your lighting by using similarly-coloured uplights and spotlights around the room. Get in touch with a Pro Light & Sound expert today!